Lots of us buy Aftershave and Perfume at Christmas, and most of the retailers bring out lovely Gift Sets. These normally work out better value than buying the bottle on it's own. Superdrug are currently offering 20% off Aftershave and Perfume Gift Sets and they start from just £4 with that discount applied. You don't need to use a promo code as the discount comes off automatically at the checkout. 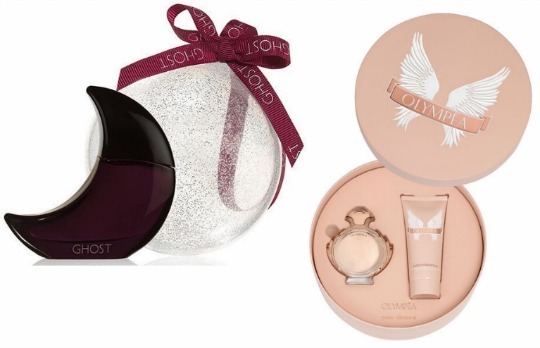 We cannot get enough of these Ghost Fragrance Bauble Gift Sets. They are just £4 in this discount event, instead of £5. There are three available and each contain a 10ml bottle of Eau de Toilette. Pick from Deep Night*, Eclipse* and Ghost Girl*. This Paco Rabanne Olympea Gift Set* miles cheaper than anywhere else at just £42.50. According to the manager of my local Perfumery is it is their bestselling Fragrance of 2015. This set is £52 to £60 elsewhere. You can Click and Collect your Aftershave/Perfume Gift Sets for FREE if spending over £10 (£1.50 if spending under £10). Delivery is £3 or FREE with orders over £10. If you are a Health and Beautycard Member then delivery is FREE no matter how much you spend.